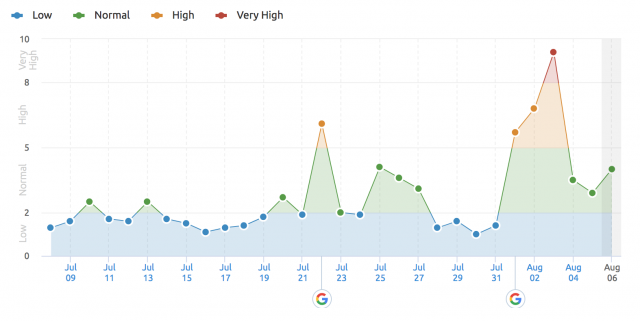 Google Core Algorithm Update Roll Out Slowing Down? On Friday, I reported at Search Engine Land and updated our original story with an update from Google on the big core algorithm update. In short, Danny Sullivan said it is still rolling out and likely will until sometime in the middle of this week. Now, watching it, over the weekend it was pretty heavy and but I think it might be starting to slow down in terms of the fluctuations webmasters are noticing. I honestly think this is one of the biggest algorithm shifts we've seen from Google in probably close to over a year. In any event, it does seem, at least over the past 24 hours, to have been starting to slow down. The chatter is pretty high still in the forums, but most of it is about what has happened versus what is happening right now. I did ask Danny Sullivan a bit more, like how big was this impact, percentagewise, like Google told us in the past. Danny said "No, not doing that." Just a reminder, I am still collecting data around this update, so if you were hit let us know. Here is my day after what we know and SEO reaction post on this Google core update. Forum discussion at Twitter, WebmasterWorld and Black Hat World.